In the biggest victories to date for the national “Fight for $15” movement, California and New York have passed legislation raising their state minimum wage to $15 an hour (though both will phase in the increase over several years). Supporters of a higher minimum wage hope the California and New York wins will give them momentum in several other states where the issue is pending. One factor complicating the minimum-wage discussion is that the cost of living varies widely – not just from state to state but within individual states, something that’s especially true in large, diverse states such as California and New York. The real value of $15 (that is, its purchasing power) very much depends on where you live: A wage that might be barely adequate in a big city could be well above the norm in a rural small town. To get a handle on those variations, we examined data on “regional price parities,” or RPPs. The RPPs, developed by the federal Bureau of Economic Analysis, measure local price levels in each of the nation’s 381 metropolitan statistical areas and the non-metropolitan portions of states, relative to the overall national price level. (The Philadelphia area’s RPP of 107.9, for instance, indicates that the overall cost of living there is 7.9% higher than the U.S. average.) In each state, we calculated how much the area with the highest RPP, and hence the highest cost of living, was above the lowest-RPP (i.e., lowest-price) area. Using the RPPs for 2013 (the latest set), the biggest gap was in Illinois: The price level in metropolitan Chicago, while only 6.6% above the national average, is 34.6% above the price level in Danville, a small city about 140 miles to the south that is the second-cheapest place to live in the nation. Not far behind Illinois are California and New York, where the most-expensive metro areas are 33.2% and 31.9% higher, respectively, than the least-expensive places. The states with the smallest gaps, such as Idaho, Wyoming and Vermont, tend to be largely rural places with few (or no) big cities. Price disparities can make a big difference when it comes to comparing wages. When we discussed this subject in a previous post, we found that a $15 nationwide minimum wage would yield $17.08 worth of purchasing power in Macon, Georgia, but only $12.26 in New York City, once the differing price levels in the two cities were taken into account. A few caveats are in order. First, about four dozen metropolitan areas cover parts of two or more states; they were allocated to the state where a majority of the metro area’s population lives. Second, because our approach was based on metro areas, Delaware and Rhode Island fell out of the final analysis. Two of Delaware’s three counties are part of larger metro areas allocated to other states (Philadelphia and Salisbury, Md. ); the third comprises the Dover metro area, where the cost of living is between the other two. The entire state of Rhode Island is within a single metro area; its cost of living is 0.7% below the national average. A couple of states have tried to address regional wage disparities in their minimum-wage laws. New York’s increase, for example, will phase in fully by 2018 in New York City, but not till 2021 in Westchester County and Long Island. Upstate, where the cost of living is considerably lower than in the New York metro area, the minimum wage is only guaranteed to reach $12.50 by 2021. And when Oregon raised its minimum wage earlier this year, it did so in geographic tiers: By 2022, the minimum (now $9.25 an hour statewide) will be $14.75 in the metro Portland, $13.50 in midsize counties and $12.50 in rural areas. 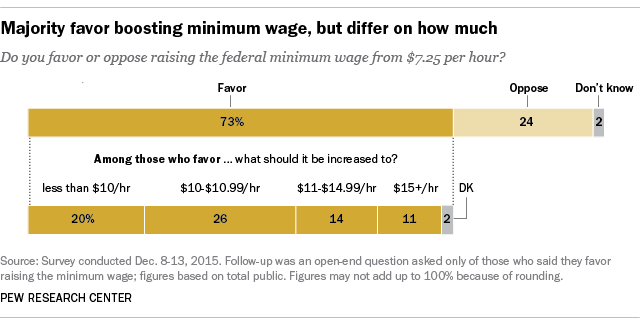 While large majorities of Americans (73% in a recent Pew Research Center survey) support raising the minimum wage, there’s less agreement on what it should be raised to. In the same survey, only 11% said the federal hourly minimum should be $15 or more; most of those favoring an increase didn’t think the minimum should be higher than $10.99.